This morning Stella and I did a little online shopping, and this little beauty ended up in my Amazon shopping cart. Stella decided it’s pretty much perfect for her – pink & purple (her two favorite colors) with a sparkly rhinestone star on it. Since she’s been our Rock Star since day one, and her name literally means star, I’m in love with it too. 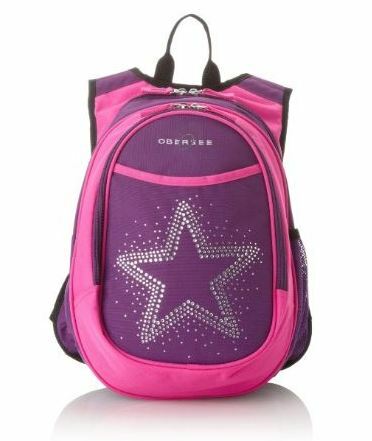 How is my baby old enough to have a school backpack?! Also, this beauty has a built in insulated lunch cooler, lumbar support, and adjustable chest strap, so it will be pretty perfect for traveling & hiking AND hopefully be quite comfortable on her back. Amazon has a clippable coupon on it right now too, so it was only $27. Score! In other school news, last Friday I got an email from her teacher letting us know that the pre-k start date is actually September 8th, not August 31st with the rest of the kids. I’m a little nervous about this, because I’m heading to Las Vegas in the wee hours of the morning on September 9th for the wedding of some close friends. I was thinking Stella would be 10 days into her school adventure – not TWO – when we decided to make this trip happen. Ugh. My stomach is in knots about it, but I’m trying to remind myself that her Dad and her grandparents will be here with her, so hopefully it won’t be too hard on her (or honestly, ME) to be gone that Wednesday-Saturday. Oh – and I also got an email yesterday saying that they do have nap time after lunch for an hour, and that we qualified for 20% off tuition, so that will save us $100/month throughout the school year and Stella will be more well rested than I was thinking originally. Yippee! Sounds like all good news. You and she will survive the trip. I think the transitions are often harder on us parents than the kids. Missing Day 2 might be better for you anyway. Gracie was still too confused on Day 1 to understand I was leaving her there. Day 2 was the most brutal day of my parenting life so far. That’s great about naptime and super cute backpack! Love the backpack.. as would Lids!! I think this all sounds so great! Don’t worry about the trip. Stella is so ready for this and will do fine. She will love it and will be excited to tell you all about it when you return from your trip… which also sounds like fun!! cute backpack! I hope stella is loving school, it sounds like everything fell into place nicely.